If your DisplayLink product does not work, has stopped working, or has never worked, follow the steps below to try and diagnose if it is a hardware problem. Note: Unless a DisplayLink product is identified by the DisplayLink software on the USB bus, the DisplayLink UI icon will not appear in the Windows system tray (v7.9 or earlier software), or will show the DisplayLink "disconnected" icon (8.0 software onwards). The UI icon will always appear in the system tray if you are running Windows 10 Anniversary update 2016, released August 2016. 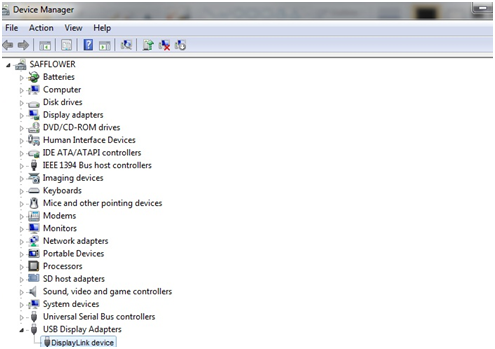 If you do not see the DisplayLink UI in the system tray, check that the device is recognised on the USB bus. If you have a product based on the DL-3xxx or DL-5xxx (USB 3.0) family, the DisplayLink UI will only appear if a DisplayLink device has been detected AND a monitor is connected to the video output. The DL-3000 family implements monitor detection and the DisplayLink UI will only be shown in the system tray when a DisplayLink device and a display is detected. This is normally due to a hardware problem. The Windows PC has tried to query the USB device to find out what it is and a device has returned a corrupt message. This is not due to a DisplayLink software or driver problem, as the OS has not even been able to recognise the device to know which driver it requires. Check other USB devices are recognised by the PC. Ensure that you are using a good quality USB cable and test again by using a different USB port on the computer. If using a USB bus powered device, make sure that the device is connected to an externally powered USB hub (the hub has a USB cable AND a power supply connected to it). This will ensure that the device is receiving enough power from the USB bus. If using a docking station, remove all other devices that may be connected to the dock and try again. This will confirm that it is not caused by another device connected to the dock. If the problem persists, then you should contact the original manufacturer, not DisplayLink, to discuss a hardware replacement of the product. If your device does not work, the first thing to check is that the DisplayLink device has been detected by Windows. This can be done by checking that the DisplayLink device appears in Windows device manager. If no devices are shown, then follow the steps below to try and make the device appear in device manager. Check the DisplayLink device does not appear under "Other devices". If there is an item under "Other Devices", follow the steps below to see if it is the DisplayLink device. Unplug all cables from the device, then reconnect power (if needed) then the USB cable. Check the USB port with another device to make sure other devices are recognised. If using a Wireless USB product, ensure the wireless USB drivers are installed separately. The wireless USB link is not part of the DisplayLink technology and will need separate drivers to be installed. Check that the USB cable works with other devices. If using a USB bus powered device, make sure that the device is connected to an externally powered USB hub (the hub has a USB cable and a power supply connected to it). This will ensure that the device an receive enough power from the USB bus. Try the adapter on another computer. If it still does not appear in device manager then you should contact the original manufacturer, not DisplayLink, to discuss a hardware replacement of the product. If a device is shown, check the Product ID to ensure it has started up correctly. Right click on the device and choose "Properties"
Choose the Property "Hardware Ids". 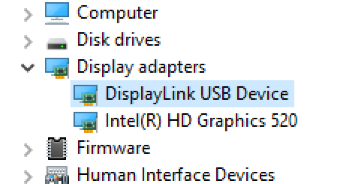 If the DisplayLink device is shown under "Other Devices", then Windows is not associating the DisplayLink USB driver with our device. Follow these steps to completely uninstall the DisplayLink software and drivers, then reinstall the latest Windows software from DisplayLink. 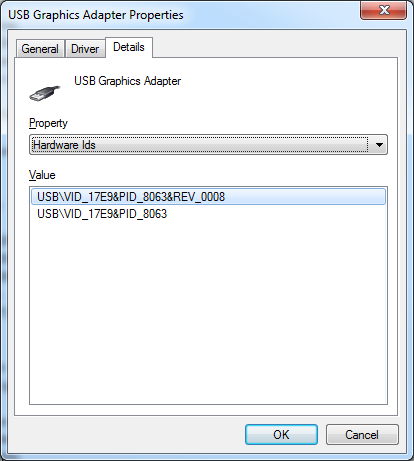 If the DisplayLink device is shown in device manager, but still does not work, then the Product ID (PID) should be checked to make sure the device has started up correctly. If the device is a DisplayLink device, you should see a value like USB\VID_17E9&PID_XXXX, where XXXX can be any hexadecimcal value (0-9 or A-F). If the device continues to appear with the same PID then then you should contact the original manufacturer, not DisplayLink, to discuss a hardware replacement of the product.